For other places with the same name, see Malaga (disambiguation). Málaga  is a large city in the southern Spanish region of Andalucia and capital of the Málaga Province. The largest city on the Costa del Sol, Malaga has a typical Mediterranean climate and is also known as the birthplace of famous Spanish artist Pablo Picasso . The city offers beaches, hiking, architectural sites, art museums, excellent shopping and cuisine. While more laid back than Madrid or Barcelona, Malaga is still the center and transport hub for the hugely popular Costa del Sol region, which is flooded with tourists in the summer, and the city has certainly cashed in on the sun and sand, with lots of new construction as well as hotels and facilities geared to tourists. 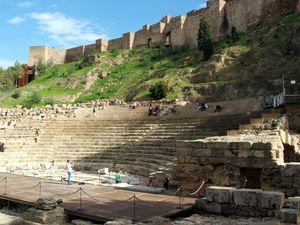 However, Malaga also offers some genuinely interesting historical and cultural attractions in its old city and its setting on the coast is still beautiful. Málaga has a mediterranean climate like the rest of the coast of Andalusia and it also one of the sunniest cities in Europe with an average of 300 days of sunshine and only 40-45 with precipitation annually. Malaga also has the warmest winter of any city in Europe with a population above 500,000 as the city is protected by the Malaga Mountains leading to the average winter temperature being 13°C (55°F). Daytime highs are usually well above 15°C (60°F) and nighttime lows rarely get below 7°C (45°F). The city does experience some days with temperatures below 5°C (42°F) but any further below 3°C (37°F) is very rare. The record low is -3.8°C (25°F), recorded on February 4th 1956 which was also the only day that Malaga experienced snowfall in the 20th century. Flurries do occur however in the mountains occasionally and the last significant snowfall was in January 2017. Summers are not as hot however as the rest of Andalusia due to the moderation of the sea. Temperatures however are usually above 30°C (86°F) during the day and around 20°C (68°F) during the night. The mercury rarely reaches 40°C (104°F) but temperatures above 35°C (95°F) are not uncommon. Málaga is also virtually dry during the summer with absolutely no precipitation during July and a 6 milimeter average in June and August. The main bus station is right across the street from the train station, a km or so west of the city centre on Paseo de los Tilos. The station serves buses from all over Spain and is a major transfer point if you're passing through this region. A substation, the Muelle Heredia bus station, is located along Avenida de Manuel Agustin Heredia, adjacent to the port and handles many of the regional buses that serve the Malaga province, such as those going to nearby beach towns, many of which are operated by the Malaga Metropolitan Transport Consortium . María Zambrano, the city's sleek new railway station, is about a km west of the city centre and served by RENFE's  high-speed AVE service, which zips travelers to Madrid in 2.5-3 hours (some with continuing service to Barcelona), Cordoba in 1 hour or Seville in 2 hours, with multiple trains running each line daily. Slower (and cheaper) trains are also available. For Granada, take a train to Bobadilla and change to a Granada-bound train there. RENFE also operates two Cercanías  commuter rail lines out of Malaga, one west along the coast to the airport and the nearby tourist towns of Torremolinos and Fuengirola and one inland. Both lines make two stops in Central Malaga: one at the María Zambrano station (where you can connect to RENFE and the bus station across the street) and one at the end of the line at Centro-Alameda, located closer to the city center where Avenida de Andalucia crosses the Guadalmedina River. The A-45 motorway runs from Cordoba to Malaga. Málaga has the fourth biggest international airport (AGP) in Spain, to which many budget airlines fly to. There are even seasonal summer flights to New York. Public transport from the airport: you can get a train, a bus or a taxi into town, or hire a car. Bus no. A costs €3 and is very convenient, running every 30 minutes and stopping at Alameda Principal and Paseo del Parque, where most of the local buses that serve the city stop as well. The stop names are shown on an electronic display inside the bus so you can tell when to get off. Bus A also stops at the coach station (beside the train station). Note that this bus used to be called nr. 19. The airport's Train station is opposite arrivals terminal 3, trains to Malaga Centro costs €1.80 (December 2017) one way into Malaga Centro (final stop), leaving from Platform 2. It runs every 20 minutes, taking approximately 12 minutes into Malaga Centro. Taxis from the airport charge a minimum airport fare of 17,00 € (fare 1)/19,01 € (fare 2) to any destination. You can get a taxi from the airport taxi rank, just outside the arrivals hall of Terminal 2. Generally there are taxis available, although you may have to queue and in the summer the queues can be very long. 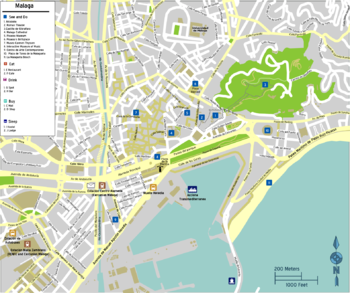 A typical journey to Málaga city centre will cost around €20, a journey to the port of Málaga will cost around €25. If you would like to avoid the long queues you can pre-book a private taxi online from Malaga airport to any destination in Andalusia. Malaga and the surrounding towns have far less scrupulous taxi drivers than Madrid or other big cities and if you are not careful, will try and rip you off. Meanwhile Málaga also constructed several bike lanes. Due to this construction the centre is also better connected with the Northern part of the city. The historical centre of Málaga is already free of motorized vehicles, which makes cycling much safer than in the past. Also spots like the boulevard and the harbor are only accessible for pedestrians and cyclists. This two kilometers long boulevard is wide enough for cyclists to enjoy and cycle in a relaxing fashion. Besides cycling in the city the coast area of Málaga is also worth exploring by bike. Going east from Malaga is probably the most popular route as its possible to travel along a route through the twin traditional fishing villages of Pedregalejo and El Palo all the way to the end of Rincon De La Victoria without going on the main road. Traveling west along the coast is not quite as straightforward, for example biking from Málaga to Torremolinos is a popular route but it is difficult to find a good route away from busy highways but it is possible. Cycling inland north from Málaga is characterized by steep climbs with little in the way of long easy winding routes. The Montes de Malaga is probably the most notable mountain route from the city where an elevation of over 900m can be reached in less than 15Km, this route is known locally as "The Reina" and is not for the lazy cyclist. Other notable climbs include a section known locally as "The Wall" which is a terrifying descent or climbers challenge depending on what direction its cycled. "The Wall" is a 9Km section between Moclinejo and Almáchar (this is the terrifying descent direction) on an inland route from Malaga to the coastal resort of Torre Del Mar. An alternative mountain route for the committed cyclist is around the "Sierra de Mijas". Initially the route goes west from Malaga on quite a busy main road past the airport, then up a steep country road to the white villages of Benalmadena Pueblo and Mijas Pueblo, dropping down then to Alhaurin el Grande and back on the north side of Sierra de Mijas to Malaga via Alhaurin de la Torre. Rock Climb. There is lots of great rock climbing in and around Malaga. The amazing El Chorro gorge is 50 minutes drive to the North West and this also features the 'Kings Walkway' - an amazing pathway suspended high above the gorge. There is also Via Ferrata and rock climbing at El Torcal near Antequerra. Beaches: The nearest beach to the centre is La Malagueta - this is fine for a days sunbathing although quieter and prettier beaches can be found further east. It can be a nice (if rather long!) walk along the waterfront to reach these beaches, otherwise you could get a bus from near the bull ring in the direction of El Palo (e.g. line 33). Sightseeing Treasure Hunt Málaga (Malaga City Adventures, [email protected]), Calle de Nicasio Calle 1 (Meeting point at Plaza de la Constitución), ☎ +34 618 250 617, . By appointment, tours last at least 2.5 hours. 20-40€. (36.72079,4.42156) editMalaga City Adventures is a startup company that pioneers in Treasure Hunting Events in Málaga. They offer Scavenger Hunt experiences suitable for tourists and team building events for companies. Equipped with a treasure hunting bag, a treasure book with information and recommendations and a modern GPS-compass you explore the historical centre of Málaga, search for hidden items and solve challenging riddles to find the secret treasure. For these tours, you are in your private group and can do the treasure hunt at your own pace. Discounts are avaiable for travelling families. Spanish: OnSpain School Málaga  is a modern and innovative language school offering a variety of Spanish courses, excursions and accommodation tailored to your needs. Spanish: Babylon Idiomas  offers a wide range of affordable and high quality Spanish courses for all levels with experienced native teachers. The school is located at 100 meters from the beach in the area of Pedregalejo, 15 minutes to the east of the city centre. New courses start every Monday. Spanish: There are many private language schools in Málaga offering a wide range of Spanish courses. To select the school and course that fit you best, you can search and compare schools and prices on Linganet Languages . The market is north of the Alamada Principal and is well worth a visit. The most typical thing to eat in Malaga is espetos, sardines skewered on a bamboo stick and grilled over a fire (typically driftwood); and pescaíto frito: all types of deep-fried fish from anchovies to squid. A specialty of Andalucia is fish (most commonly dogfish "cazon", although sometimes other fish such as tuna, "atun") marinated in a garlic and vinegar preparation - look on the menu for "Cazon en adobo". Try also the coquinas (small clams cooked in white wine). Simply delicious! Jamon is a regional specialty, and is an aged, salted ham, from acorn-fed pork, similar to prosciutto. Famous sweet Malaga wine can be tasted in popular pubs in the city center, like the famous old La Casa del Guardia (Avenue Alameda Principal) or the very typical El Pimpi where everyone, from celebrities to local teens meet. For good food against competitive prices, try the port area. The eastern quay is littered with restaurants competing for your patronage. They generally offer good food at mild rates. With Italian, Spanish, Mexican and Indian cuisine only being a few random examples from the wide range of restaurants, there's bound to be something to your liking. As a bonus, if you sit outside, you can look out over the water while enjoying your meal. If all you see is bars instead of restaurants, you are too northerly. The restaurants are along the southern stretch of the quay. Iberian ham & cheese at Bodeguita El Gallo. Restaurante Gallego Candamil. Cuarteles 15. Tel. :+34 95 232-3907. 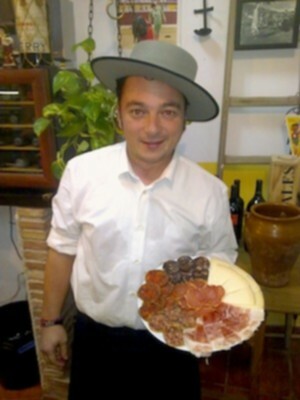 On the street leading from the train station to the centre, this Galician restaurant is very popular with the locals. This is understandable when you see the great range of quality tapas at fantastic prices, e.g. tapa of empanada €1.25, glass of cider €1.15. A Casa Gallega. Fernán Núñez 2. Tel. : +34 95 204-2332. Another Galician haunt a little further towards, although still outside, the center, this one does not have any menu but relies on the clientele knowing what they want. Good empanada, pimientos de Padrón. Atmospheric. Parador de Málaga Gibralfaro, Castillo de Gibralfaro, Tel. : +34 95 222-1902, . Some report being disappointed by the restaurant at the Parador. The food was sub par, but the service by contrast was exemplary, together with all the nice little free appetizers, aperitifs, etc. Wine list tended towards the expensive but with the excellent idea of a monthly wine choice 'balancing quality and value', for example a very palatable Ribera del Duero Crianza at €10. Set menu €27 pp (plus VAT). Fantastic view of the city, especially from the terrace. Las Garrafas. Calle Méndez Núñez 6. Tel. : +34 95 222-3589. Winery and "taperia". Typical Málaga cuisine in a large and clean locale. Delicious and reasonably-priced food. Especially recommended are the mouth-watering "albondigones," large meatballs served alongside french fries. Loving Hut. Calle Peregrino No.2. Tel. : +34 95 235-1521. Chinese vegetarian food, EUR7.95 Buffett open 13:00 - 16:00 & 20:30 - 23:00 near Malaga Centro underground metro station. Malaga has a typically sweet wine called Mosto made from muscat grapes. Nyx, Urbano, Village Green (Rock, Indie, etc). Malaga Hotel, Acacias de Guadalmar, 153 - 29004 Malaga, ☎ +34 95 217-6061 ([email protected], fax: +34 9521756552), . checkin: 2PM; checkout: 12PM. Malaga has exceptional road and motorway links, making it an excellent base for exploring the nearby villages and towns. Wonderful drives inland reveal the hidden gems of this region, with small restaurants nestling in the hills where you can experience a truly authentic taste of Andalucia. There are also several tourist holiday resorts within reach: Torremolinos, Fuengirola, Nerja and Marbella. This page was last edited on 11 April 2019, at 15:09.